A research firm is now forecasting that the werarables market could have gone out of fashion by 2016. According to the predictions that have been produced by a research firm regarding the wearable technology market, those mobile devices may already be edging toward the crest of a wave that could soon come crashing down. The market is estimated to be made up of as many as 48 million device shipments, at the moment. These wearable technology devices include everything from smatwatches to head mounted displays to fitness trackers, and even patches that adhere directly to the skin, among others. At the moment, many of them – particularly in the activity tracking category – are flying off the store shelves nearly as quickly as they can be placed there. However, if things go as has been predicted to NPD DisplaySearch, the hype will reach its maximum by the end of 2014, and it will only decline from there. 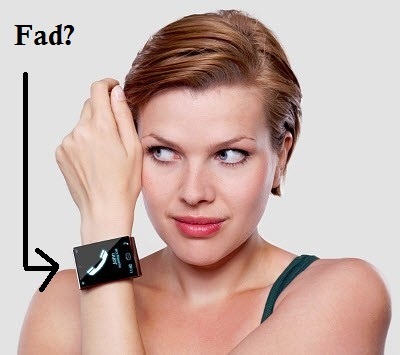 In fact, the wearable technology predictions are dramatic enough to say that the demand will be all but wiped out. The NPD DisplaySearch report said that the actual hype that these wearables are generating has already started to fade. It stated that unless the prices fall considerably or there is a wearable device that is launched that offers the ability to become an essential tech gadget comparable to the role currently played by the smartphone, then there is a very real risk that smartglasses and smartwatches will be seen as nothing more than a fashion fad and they will be gone as quickly as they arrived. That said, the report also acknowledges that the actual evolution of wearable technology devices remains unknown, and there is still a great potential for one or several styles to be able to find the necessary consumer niche.